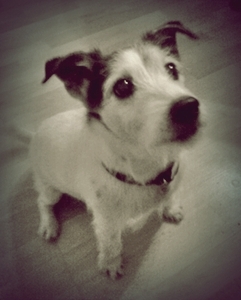 I started writing this article on how to give a dog pills as I have just given my fourteen year old Jack Russell, Murdoch, the last of a total of fifteen days worth of antibiotics, two tablets, twice a day. He had to have ten day’s worth before his operation (infected tooth) and five days after. Even though Murdoch is an old sweetie and would never dream of biting me, he is also a cunning old rogue and at first, even when I thought the pill had been safely swallowed, he would somehow manage to manipulate it to the corner of his mouth so that it fell out onto the floor! This set me to thinking that with something as crucial as a long-term medical condition or for preventative heartworm medication when it is vital that all of the medication goes down, every time, without fail to ensure that the dog is effectively protected against a heart worm infection, that other owners might also like some tips on how to give their dogs pills and tablets effectively. So, I have been gathering information from across the Internet. Some has been posted by pet owners in forums, some by animal healthcare professionals but in amongst them, I hope you find something useful that will help you and your dog. I will reveal my method of choice at the end of this page! This is Murdoch now aged 14 who has recently had to have a course of antibiotics for an infected tooth[/caption]The first method is called the pill push method and is exactly as the name suggests. You need to first, gently open your dog’s mouth, and hold his jaw open with one hand whilst pushing the pill as far as you can down over the dog’s tongue. With a small dog this is not so tricky, especially if you have someone else to hold the dog in their arms. To ensure the pill goes down, there are a few tricks that will help. Hold the mouth closed, lift his nose up and gently rub his throat to encourage swallowing. Blow on the dog’s nose whilst you are holding his mouth closed, this also encourages swallowing. Talk to your dog the whole time, encouraging him and be sure to give him a tasty treat afterwards so that he associates submitting to the pill swallowing with something nice at the end. This video effectively demonstrates the pill push method and shows another way of getting your dog to swallow too! The second method is called the pill crush method. You should be aware that some medications should not be crushed because they have coatings to prevent the contents coming out before the pill gets into the stomach. However, if your vet has told you it is ok to crush the medication, the easiest way is to put the pill into one spoon and crush it with the bowl of another spoon. This is really easy to do. Alternatively, place the pill(s) in a small plastic bag and crush with a pastry rolling pin. Once the correct dosage has been crushed, it is easy to mix it with a treat of a creamy consistency that your dog really likes, canned dog food, cream cheese or peanut butter seem to be the favourites. For my younger Jack Russell, Bandit, it is a small serving of my homemade strawberry jam! It is easiest to just let the dog lick the spoon to get all the treat and crushed pill mix. The third way of getting those pills to go down, is to hide them in food. Cheese or a more solid piece of meat is an easy way, just cut a slit in a small cube of your chosen foodstuff, slide the pill in and press the edges together. Pill Pockets are commercially available and these are little treats in which a pill can be hidden and then sealed by pressing the edges together. 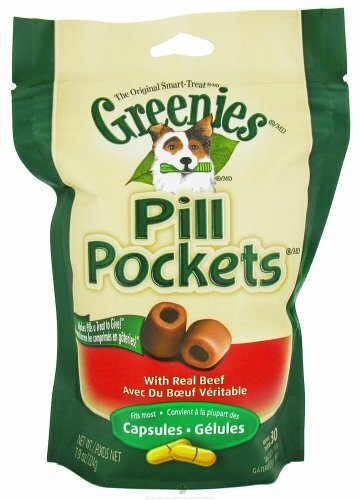 The Greenies Pill Pockets are probably the most popular and are available in two sizes, either for capsules, or pills. The beef flavor (pictured) or chicken flavor and both for capsules easily obtainable at a great price from Amazon, you can find the pill type here. From my own experience, I have found it easiest to get the dogs interested by giving them an ‘un-doctored’ treat first, getting them a bit excited about the treats before offering the one with the pill in – this way it usually gets gobbled down really fast as the dog is looking for the next treat already! You should not use the pill-push method if you have long nails. The last thing you want to do is scratch the inside of your pet’s mouth or throat. You also should not use this method on flat faced dogs as this can cause a problem for their breathing. As mentioned above, be sure that it is ok for pills to be crushed before using this method and don’t mix it into your pet’s normal meal as either, he won’t finish his food and you don’t know how much of the medication he has had or, one of his ‘brothers’ will come and steal the leftover food and get medication not intended for them. If you use the pill pockets method with the purchased, specially designed product, be sure to keep the packet sealed between doses of medication so that the material they are made of stays soft and malleable so that you can seal the pill inside. If you let them dry out they don’t work so well. If giving heartworm preventatives you could try the chewable brands which are usually no problem to give and dogs find them very tasty. Of course, these are only suitable if your dog is not allergic to either beef (in Heartgard) or pork (in Sentinel). Which method did I use when I had to give my dog his pills? I used the pill push method, rewarding him with a treat afterwards. My husband was on hand to hold Murdoch in his arms so it was easy for me to have both hands free to help the medicine go down! I have found that P-nut butter works the best. First of all, the p-nut butter STICKS to the pills! Second, since dogs don’t chew p-nut butter, they will swallow their pills easily and eagerly. We are having to give our dog 3 pills twice daily for 1 month to prepare him for heartworm treatment, so the battle of getting him to take his pills for the first two weeks was very nerve racking until I came up with the idea of using p-nut butter. Wish we did this from the ‘get-go’!!! Hi Mary, thanks for the great tip about peanut butter. I guess some dogs will not be able to take peanut butter but it certainly sounds as if it is very effective for those that can. Hope the heartworm treatment goes well. Please let us know how your dog gets on with that. Thank you for posting this! I found a flea on my dog even though I give her frontline the first of everymonth. She has broken out everywhere and I think she’s allergic to either the flea or something outside. I’ve been giving her childrens chewable Benadryl the last couple of days, but she has gotten worse each time taking it I tried everything, but she always pushed it out even with peanut butter. I thought of crushing the pill but didn’t know if u could to it I tried it and put it in a pill pocket we lost a little but didn’t even think to do the peanut butter because she kept pushing it out of the peanut butter. Hopefully she will eat the peanut butter with the pills crushed can’t wait to try it!